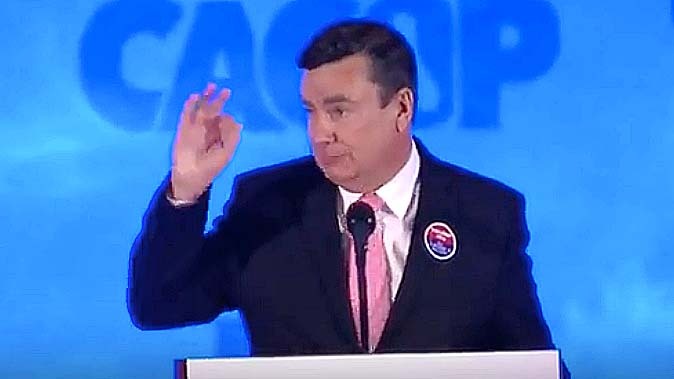 State Sen. Joel Anderson effectively endorsed Donald Trump for president Friday when he introduced the billionaire businessman at the California Republican Party convention in Burlingame. Speaking at the Hyatt Regency near San Francisco International Airport, Anderson went on to say Americans want to work hard, “and we want to win again,” echoing another Trump catch phrase. Earlier, Anderson alluded to the protests outside that Hyatt that forced Trump and his staff and Secret Service entourage to enter the hotel from the back. Anderson, whose 38th District term ends in 2018, joined fellow East County lawmaker Rep. Duncan Hunter in backing Trump. The district is heavily Republican, and includes wide parts of North and East County, including the cities of San Marcos, Escondido, Poway, Santee, El Cajon and La Mesa.